In November 1888, a Mr J. Baker purchased an interesting bell which had been found at a farmhouse in Bosbury amongst some old lumber. Ella Mary Leather writing in 1902, says that the price paid was a pint of beer and that, when the bell was struck, it had a ‘harsh but sonerous’ tone. She surmises it was a portable bell which was sounded as it accompanied a funeral procession. The bell was taken to London and presented to the Horniman Museum. 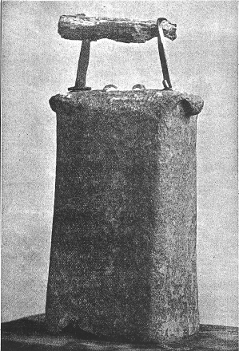 The Curator of the museum at this time, Richard Quick, was particularly interested in bells and, in December 1895, presented a talk at a meeting of the the British Archaeological Association where he showed the Bosbury bell to his audience. It is a hand bell roughly 265 mm high, excluding the handle, 150 by 65 mm along the top and 150 by 115 mm at the mouth. It is made from an iron plate, folded and rivetted, and dipped in molten bronze. A little bit of the bronze coating still remains and the iron clapper is still fitted. In the Horniman Museum Fifth Annual report of 1895 it is suggested as dating from the 6th century. Such bells are found in Ireland and Scotland but rarely in England. My special thanks to Hayley Egan, the Archivist at the Horniman Museum, Forest Hill, London, for her assistance in assembling this information. The bell is object number 1790 in the collection and is in store at the Horniman Study Collections Centre at Greenwich. The museum and gardens are open daily from 10.30am to 5.30pm and entrance is FREE. Prepared by Barry Sharples 31 May 2010.